Diane Malaspina for Organic Facts discusses the many benefits of yoga. Learn how yoga can change your life for the better – mind, body, and spirit. The practice of yoga is over 5,000 years old, yet research is revealing modern benefits for both body and mind. Delving deeper into what the ancient practice entails provides some clues as to why yoga is transformative for the estimated 300 million people who practice worldwide. Bringing yoga into your life can be quite transformational. It has a variety of healing effects on the body. It also changes the structure of the brain in a way that improves how we mentally process our experience in the world. Let us look at the different ways this ancient practice has a transformational effect on us. Firstly, the physical practice of yoga has a myriad of benefits for the body including increased flexibility, muscle tone, and strength, improved cardiovascular health, respiration, and vitality, and preventing cartilage and joint breakdown. Mentally, yoga practitioners report decreased depression, anxiety, stress, and fatigue (Michalsen, et al., 2005). With this practice, we get double the bang for the buck: enhanced health paired with mental and emotional balance. Consequently, this leads to more self-confidence and the feeling of living well in our bodies. Over time, the lessons learned on the mat – healthy movement, breath awareness, and stress reduction – start to influence how we live off the mat through lifestyle choices such as healthier eating, management of stress, and the importance of taking time for self-care. Beyond the physical practice of yoga, the original yogis described a system that also included controlled breathing, concentration, and meditation techniques. These techniques have a significant influence on the nervous system. Considering that most adults’ nervous systems are sympathetic-dominant (i.e., overwhelmed and over-stressed), yoga postures, breathing, and focusing the mind are natural remedies that balance the nervous system by activating the relaxation response. During rest, the nervous system takes on cleanse and repair functions, which are key to recovering from the stresses and strains in life. Breath awareness and meditation are transformative tools that can empower you to change your state from stress to calm in a matter of minutes. With increased availability and accessibility, yoga has become more mainstream, creating a sense of mutual transcendence where practicing in a group allows us to feel a part of something larger. Living in the digital world, we have less person-to-person interaction. One of the most powerful and healthy ways to meet people and make lasting authentic connections is by practicing together! There is a sense of ‘we are all doing this together,’ which serves to facilitate exchange between others. Certainly, practicing yoga is a great way to build social connections and become part of a health-oriented community. 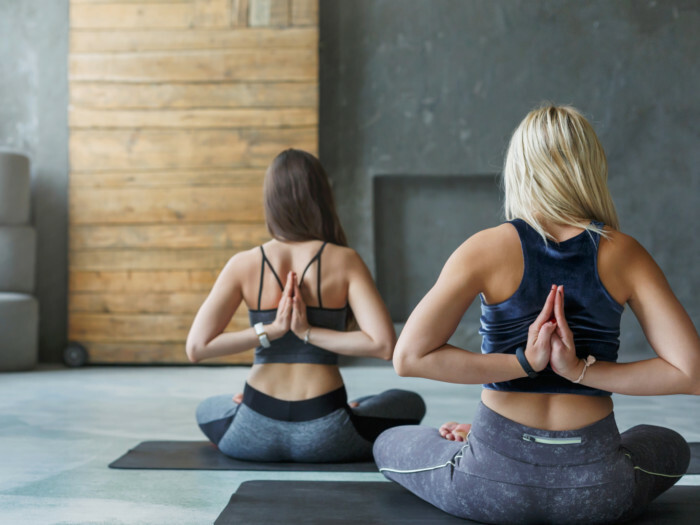 Modern science continues to reveal the positive effects yoga has on the body and mind and the ancient practice gives us the tools to take charge of our well-being. JOIN US FOR OUR NEXT RETREAT! Diane Malaspina, Ph.D., is a psychologist, yoga teacher, and consultant working in the field of health and wellness since 2001. Diane’s work is split between teaching yoga and her consulting business as a psychologist, where her specialty is implementing evidence-based strategies to reduce stress and foster healthy behaviors. Diane is currently working on a 1000 hour certification with Yoga Medicine while developing therapeutic yoga and meditation programs in her community. She earned 200 hour certifications from Shiva Rea (Prana Vinyasa Flow) and YogaWorks and a 500 hour certification from Yoga Medicine, as well as hundreds of hours of advanced training in meditation, pranayama, and philosophy. Diane is registered as a Yoga Medicine® Therapeutic Specialist. She lives a few blocks from the Atlantic Ocean in Virginia Beach with her husband, Omar and rescue dog, Prana. To learn more about Diane's offerings, visit: www.binduwellness.com.